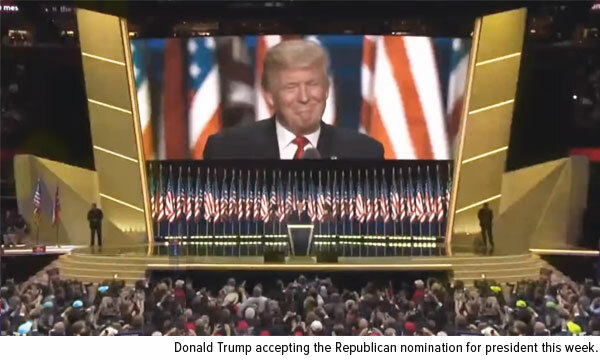 Looking more Las Vegas casino than Oval Office, the stage Donald Trump delivered his nomination acceptance speech from Thursday was all gold, from the stairs to the podium, completely befitting of his showman-like style. Whether you support or oppose Trump, it’s time to face reality. This is really happening, and we should all brace ourselves for what will surely be one of America’s messiest, ugliest general election seasons. Only time will tell which candidate will be triumphant in November, but in the meantime, one of the winners might very well be gold, which has traditionally attracted investors in times of political and economic uncertainty. In the United Kingdom, which voted one month ago to leave the European Union, gold dealers are seeing “unprecedented” demand, especially from first-time buyers. Some investors are reportedly even converting 40 to 50 percent of their net worth into bullion, though that’s not advisable. (I always suggest a 10 percent weighting, diversified in physical gold and gold mining stocks.) In Japan, where government bond yields have fallen below zero and faith in Abenomics is flagging, gold sales are soaring. It’s not unreasonable to expect the same here in the U.S. between now and November (and beyond). 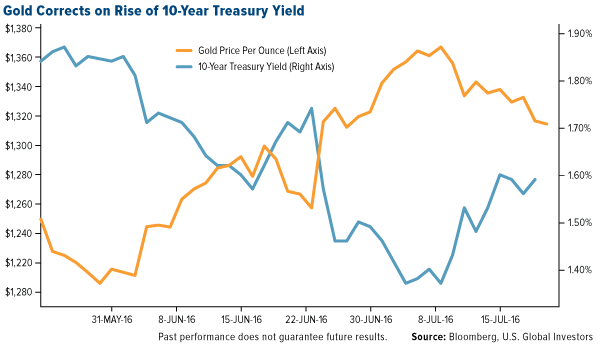 More so than the upcoming election, gold prices are being driven by U.S. dollar action, interest rates and low-to-negative bond yields around the world. (Between $11 trillion and $13 trillion worth of global sovereign debt currently carries a negative yield.) Right now the yellow metal is in correction mode on a strengthening dollar and rising two-year and 10-year Treasury yields, both of which share an inverse relationship with gold. 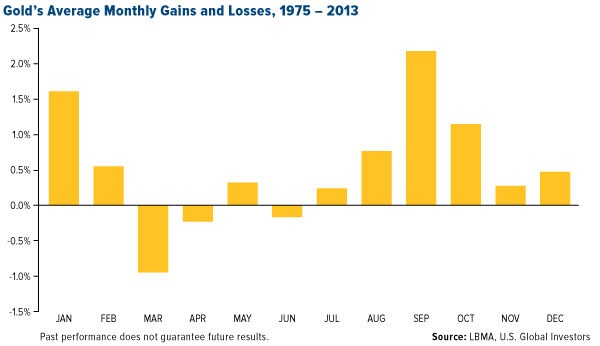 It’s also worth mentioning that the summer months have historically been among the weakest. By contrast, some of the highest gold returns of the year have occurred in September, when the Love Trade heats up in India in anticipation of Diwali and the wedding season. For the past several trading days, gold demand had also been overshadowed by a hot equities market, with many stocks hitting 52-week highs. Both the S&P 500 Index and Dow Jones Industrial Average closed at all-time highs, twice in the latter’s case. 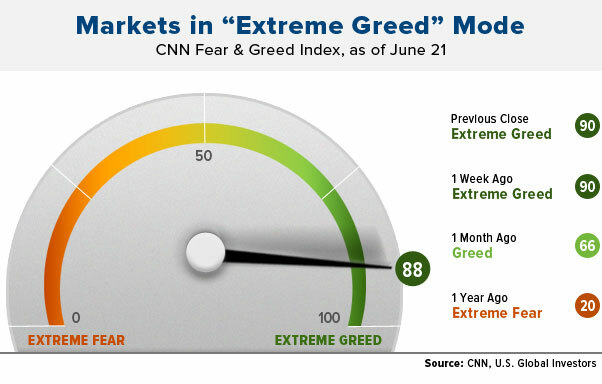 The CNN Fear & Greed Index, which measures investor sentiment, is currently in “Extreme Greed” mode, at more than a two-year high. With gold taking a breather, now might be a good buying opportunity. Since 1970 there have been only four major gold bull markets, and the consensus among analysts right now is that we’re in the early stages of a new one, with end-of-year forecasts in the $1,400 an ounce range. Learn more about what’s driving gold. Despite gold’s correction, the metal got a boost last Thursday courtesy of Mario Draghi. The European Central Bank (ECB) president, as expected, announced that euro area interest rates and asset purchases would remain unchanged as economic ramifications of the Brexit referendum continue to be assessed. 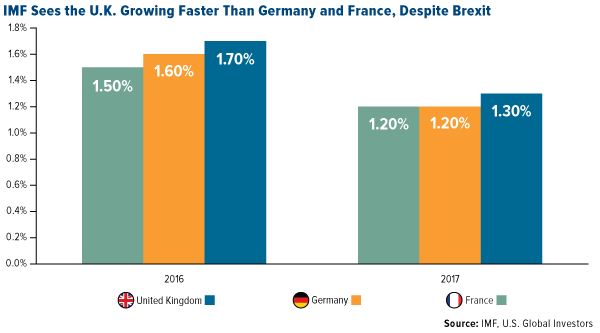 Speaking of Brexit, Draghi noted that markets have met the volatility and uncertainty in the month following the U.K. referendum with “encouraging resilience.” Like many others, he had predicted that Brexit would dramatically stunt euro growth, but as we’ve already seen, such claims are overdone. In a note released last week, securities trading firm KCG wrote that June 24, the day following the British referendum, “was no repeat of August 24,” a reference to the “flash crash” that struck equities last summer and led to ETF mispricing. Following Draghi’s statement, gold prices immediately popped in Thursday morning trading, effectively hitting the pause button on the correction. On Friday, though, prices continued to slide, contributing to gold’s second straight week of losses. The next hurdle to be cleared is a U.S. interest rate hike. Expectations that rates will go up in September have wobbled back and forth since Brexit, but in recent days, it’s been reported that Federal Reserve officials feel confident enough to raise them at least once before the end of the year. Gold will face additional pressure if rates are allowed to rise, but if the Fed chooses to stand pat, it could serve as another catalyst for a price surge.